If you play World of Warcraft and haven't yet merged your WoW account with a Blizzard Battle.net account, you're running out of time - all WoW accounts will become Battle.net ones on November 11th. Blizzard is all over its shiny new Battle.net that the company will be rolling out either when StarCraft II ships or when the apocalypse rolls around in 2012, whichever happens first. While WoW players have been able to manually merge their WoW account with a Battle.net one for quite some time now, the switch will be mandatory as of November 11th. [Our] new way for players to log in to World of Warcraft and future Blizzard games, sign up for upcoming beta tests, shop the online Blizzard Store, and more with just one username and password. 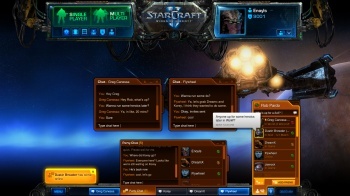 This was just the first step in the rollout of the brand-new Battle.net; in the future, players will be able to use Battle.net to participate in cross-realm chat in World of Warcraft, create real-life friends lists, communicate across different games, and a whole lot more. If you haven't changed your account over yet, you won't be able to log into the game until you do. On the bright side, as a reward for your trouble, everyone who merges their WoW account with their B.net one (which should be, uh, everybody) will get a little baby penguin in-game pet. That sounds adorable, and I'm all over the adorable. In practical terms, this... doesn't change much, actually. It just means that you sign into the game with a different username (in this case, your email address) than you usually do. So... it might be a bit annoying, but it's a minor hassle at worst. Come on. Think of the baby penguins!